The Anoxia technique is unique for creating an environment without oxygen under atmospheric circumstances. High expansion foam is produced by mixing nitrogen, a mixture of water and specially developed high expansion detergent. The expansion rate is upto 1:1000, meaning that 1 litre of water/foam agent mix expands up to 1 m3 foam. Due to the specially designed foam generator, the high expansion foam bubbles are filled with a > 99% concentration of nitrogen. Therefore, the oxygen level surrounding the animal drops from 21% in atmospheric air to < 1 % once the animal is submerged in the foam. The animals need a constant supply of oxygen to the brain. Applying Anoxia foam, the oxygen is replaced by nitrogen. 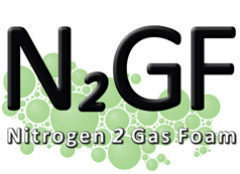 As a result the nitrogen level is raised to > 99% and the oxygen level is lowered to < 1%. Considering the natural reaction to sudden lack of oxygen the animal is rendering quickly into unconsciousness. As a consequence, behavioral indicators like loss of posture and convulsions will appear. With this in mind, unconscious animals are insensitive to perceive unpleasant sensations like pain. First of all, a mixture of 97% water and 3% high expansion foam agent is sprayed into the Anoxia foam generator, creating a thin film on the outlet of the generator. At the same time, nitrogen is added with overpressure into the foam generator. The nitrogen expands when it exits the generator. This creates a robust high expansion foam. The high expansion foam bubbles are filled with > 99% nitrogen. The choice of the volume of the container depends of the size of the animal and/or the number of animals that need to be stunned/killed. A lid with a chiffon seals the container. As soon as the foam exits the chiffon, the gas supply is stopped and the chiffon is closed. The nitrogen gas concentration in the container remains at 99%.